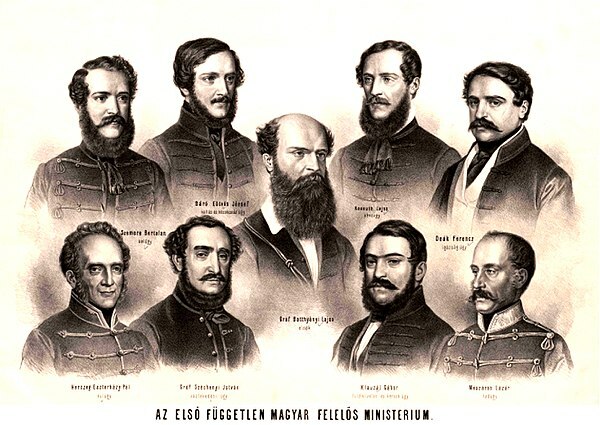 The Hungarian Revolution of 1848 (Hungarian : 1848–49-es forradalom és szabadságharc, "1848–49 Revolution and War") was one of the many European Revolutions of 1848 and closely linked to other revolutions of 1848 in the Habsburg areas. The revolution in the Kingdom of Hungary grew into a war for independence from the Austrian Empire, ruled by the Habsburg dynasty. Hungarian is a Finno-Ugric language spoken in Hungary and parts of several neighbouring countries. It is the official language of Hungary and one of the 24 official languages of the European Union. Outside Hungary it is also spoken by communities of Hungarians in the countries that today make up Slovakia, western Ukraine (Subcarpathia), central and western Romania (Transylvania), northern Serbia (Vojvodina), northern Croatia and northern Slovenia. It is also spoken by Hungarian diaspora communities worldwide, especially in North America and Israel. Like Finnish and Estonian, Hungarian belongs to the Uralic language family. With 13 million speakers, it is the family's largest member by number of speakers. 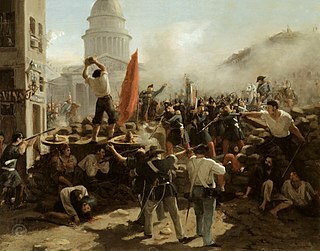 The Revolutions of 1848, known in some countries as the Spring of Nations, People's Spring, Springtime of the Peoples, or the Year of Revolution, were a series of political upheavals throughout Europe in 1848. It remains the most widespread revolutionary wave in European history. 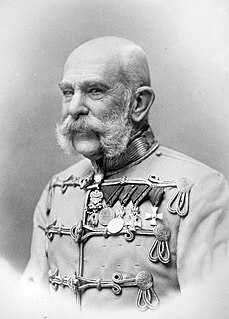 Franz Joseph I or Francis Joseph I was Emperor of Austria, King of Hungary, and monarch of many other states of the Austro-Hungarian Empire, from 2 December 1848 to his death. From 1 May 1850 to 24 August 1866 he was also President of the German Confederation. He was the longest-reigning Emperor of Austria and King of Hungary, as well as the third-longest-reigning monarch of any country in European history, after Louis XIV of France and Johann II of Liechtenstein. The Holy Alliance was a coalition linking the monarchist great powers of Russia, Austria and Prussia. It was created after the final defeat of Napoleon at the behest of Tsar Alexander I of Russia and signed in Paris on 26 September 1815. 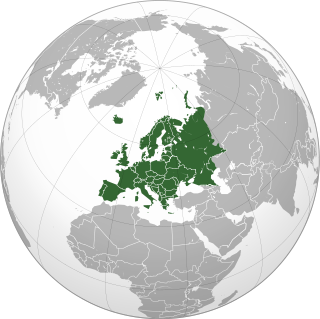 The alliance aimed to restrain liberalism and secularism in Europe in the wake of the devastating French Revolutionary Wars, and it nominally succeeded in this until the Crimean War (1853–1856). Otto von Bismarck managed to reunite the Holy Alliance after the 1871 unification of Germany, but the alliance again faltered by the 1880s over Austrian and Russian conflicts of interest with regard to the dismemberment of the Ottoman Empire. Nicholas I reigned as Emperor of Russia from 1825 until 1855. He was also the King of Poland and Grand Duke of Finland. He has become best known as a political conservative whose reign was marked by geographical expansion, repression of dissent, economic stagnation, poor administrative policies, a corrupt bureaucracy, and frequent wars that culminated in Russia's defeat in the Crimean War of 1853–56. Nicholas had a happy marriage that produced a large family; seven children survived childhood. His biographer Nicholas V. Riasanovsky says that Nicholas displayed determination, singleness of purpose, and an iron will, along with a powerful sense of duty and a dedication to very hard work. He saw himself as a soldier—a junior officer totally consumed by spit and polish. A handsome man, he was highly nervous and aggressive. Trained as an engineer, he was a stickler for minute detail. In his public persona, says Riasanovsky, "Nicholas I came to represent autocracy personified: infinitely majestic, determined and powerful, hard as stone, and relentless as fate." He was the younger brother of his predecessor, Alexander I. Nicholas inherited his brother's throne despite the failed Decembrist revolt against him and went on to become the most reactionary of all Russian leaders. 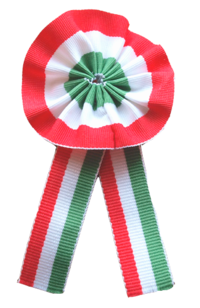 A number of public holidays and special events take place each year in Hungary. The Diet of Hungary or originally: Parlamentum Publicum / Parlamentum Generale became the supreme legislative institution in the medieval kingdom of Hungary from the 1290s, and in its successor states, Royal Hungary and the Habsburg kingdom of Hungary throughout the Early Modern period. The name of the legislative body was originally "Parlamentum" during the Middle Ages, the "Diet" expression gained mostly in the Early Modern period. It convened at regular intervals with interruptions during the period of 1527 to 1918, and again until 1946. Pest is the eastern, mostly flat part of Budapest, Hungary, comprising about two thirds of the city's territory. It is separated from Buda and Óbuda, the western parts of Budapest, by the Danube River. Among its most notable sights are the Inner City, the Hungarian Parliament, Heroes' Square and Andrássy Avenue. In colloquial Hungarian, "Pest" is often used for the whole capital of Budapest. The three parts of Budapest united in 1873. Joseph II was Holy Roman Emperor from August 1765 and sole ruler of the Habsburg lands from November 1780 until his death. He was the eldest son of Empress Maria Theresa and her husband, Emperor Francis I, and the brother of Marie Antoinette. He was thus the first ruler in the Austrian dominions of the House of Lorraine, styled Habsburg-Lorraine. Joseph was a proponent of enlightened absolutism; however, his commitment to modernizing reforms subsequently engendered significant opposition, which resulted in failure to fully implement his programmes. He has been ranked, with Catherine the Great of Russia and Frederick the Great of Prussia, as one of the three great Enlightenment monarchs. His policies are now known as Josephinism. He died with no sons and was succeeded by his younger brother, Leopold II. Ignác Martinovics was a Hungarian philosopher, writer and a leader of the Hungarian Jacobin movement. He was condemned to death for high treason and beheaded on 20 May 1795, along with count Jacob Sigray, Ferenc Szentmarjay, Joseph Hajnoczy and others. Leopold II was Holy Roman Emperor, King of Hungary, and Bohemia from 1790 to 1792, and Archduke of Austria and Grand Duke of Tuscany from 1765 to 1790. He was the earliest opponent of capital punishment in modern history. He was a son of Emperor Francis I and his wife, Empress Maria Theresa, and the brother of Marie Antoinette, Queen of France and Joseph II, Holy Roman Emperor. Leopold was a moderate proponent of enlightened absolutism. He granted the Academy of Georgofili his protection. Sándor Petőfi was a Hungarian poet and liberal revolutionary. He is considered Hungary's national poet, and was one of the key figures of the Hungarian Revolution of 1848. He is the author of the Nemzeti dal, which is said to have inspired the revolution in the Kingdom of Hungary that grew into a war for independence from the Austrian Empire. It is most likely that he died in the Battle of Segesvár, one of the last battles of the war. Móric Jókay de Ásva, outside Hungary also known as Maurus Jokai or Mauritius Jókai, was a Hungarian dramatist, novelist and revolutionary. He was active participant and a leading personality in the outbreak of Hungarian Liberal Revolution of 1848 in Pest. Jókai's romantic novels became very popular among the elite of Victorian era England, he was often compared to Dickens in the 19th century British press. One of his most famous fans and admirers was Queen Victoria herself. In 1825 Emperor Francis II convened the Diet in response to growing concerns amongst the Hungarian nobility about taxes and the diminishing economy, after the Napoleonic wars. This – and the reaction to the reforms of Joseph II – started what is known as the Reform Period (Hungarian : reformkor). [ citation needed ] But the Nobles still retained their privileges of paying no taxes and not giving the vote to the masses. The interval between the diet of 1843 and that of 1847 saw a complete disintegration and transformation of the various political parties. Széchenyi openly joined the government, while the moderate Liberals separated from the extremists and formed a new party, the Centralists. The conservatives - who usually opposed most of the reforms - could maintain a slim majority in the old feudal parliament, as the reformer liberals were divided between the ideas of Széchenyi and Kossuth. An annual parliamentary session in Pest. Juries and representation on an equal basis. The army to swear to support the constitution, our soldiers should not be sent to abroad, and foreign soldiers should leave our country. The freeing of political prisoners. Austria had its own problems with the revolution in Vienna that year, and it initially acknowledged Hungary's government. Therefore, the Governor-General's officers, acting in the name of the King appointed Hungary's new parliament with Lajos Batthyány as its first Prime Minister. The Austrian monarchy also made other concessions[ which? ] to subdue the Vienna masses: on 13 March 1848, Prince Klemens von Metternich was made to resign his position as the Austrian Government's Chancellor. He then fled to London for his own safety. 5 July 1848: The opening ceremony of the first parliament, which was based on popular representation. The members of the first responsible government are on the balcony. 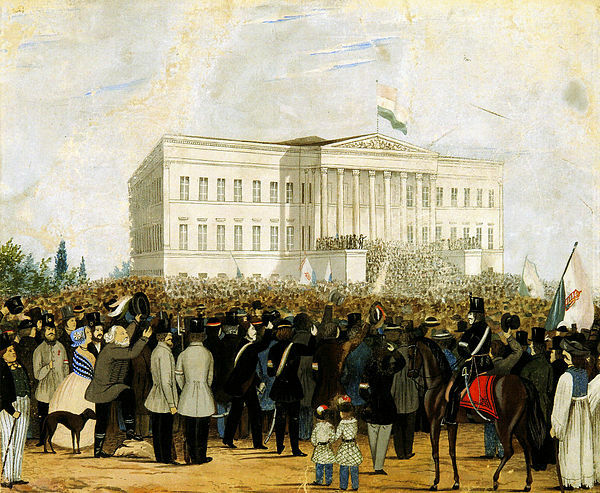 On 17 March 1848 the Emperor assented and Batthyány created the first Hungarian responsible government. On 23 March 1848, as head of government, Batthyány commended his government to the Diet. With the exception of Lajos Kossuth, all members of the government were the supporters of Széchenyi's ideas. The Ten Points, or the March Laws as they were now called, were then adopted by the legislature and received royal assent on 10 April. Hungary had, to all intents and purposes, become an independent state bound to Austria only by the Austrian Archduke as Palatine. The new government approved a sweeping reform package, referred to as the "April laws", which created a democratic political system. The newly established government also demanded that the Habsburg Empire spend all taxes they received from Hungary in Hungary itself, and that the Parliament should have authority over the Hungarian regiments of the Habsburg Army. At that time the internal affairs and foreign policy of Hungary were not stable, and Batthyány faced many problems. His first and most important act was to organize the armed forces and the local governments. He insisted that the Austrian army, when in Hungary, would come under Hungarian law, and this was conceded by the Austrian Empire. He tried to repatriate conscript soldiers from Hungary. He established the Organisation of Militiamen, whose job was to ensure internal security of the country. Batthyány was a very capable leader, but he was stuck in the middle of a clash between the Austrian monarchy and the Hungarian separatists. He was devoted to the constitutional monarchy and aimed to keep the constitution, but the Emperor was dissatisfied with his work. Josip Jelačić was Ban (Viceroy) of Croatia and Dalmatia, regions included in the Kingdom of Hungary. He was opposed to the new Hungarian government, and raised troops in his domains. In the summer of 1848, the Hungarian government, seeing the civil war ahead, tried to get the Habsburgs' support against Jelačić. They offered to send troops to northern Italy. In August 1848, the Imperial Government in Vienna officially ordered the Hungarian government in Pest not to form an army. On 29 August, with the assent of parliament, Batthyány went with Ferenc Deák to the Emperor to ask him to order the Serbs to capitulate and stop Jelačić, who was going to attack Hungary. But Jelačić went ahead and invaded Hungary to dissolve the Hungarian government, without any order from Austria. 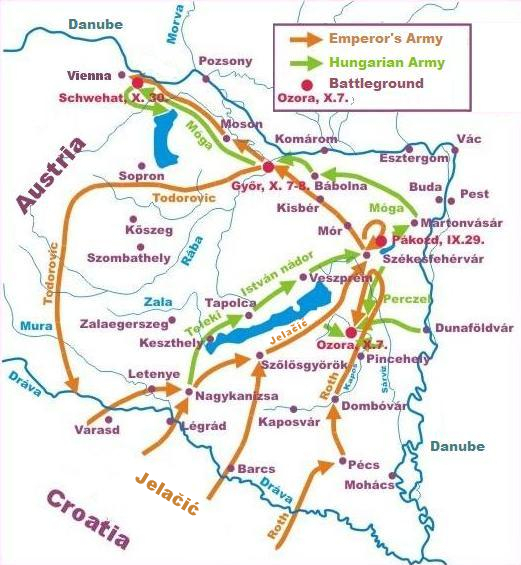 Though the Emperor formally relieved Jelačić of his duties, Jelačić and his army invaded Muraköz (Međimurje) and the Southern Transdanubian parts of Hungary on 11 September 1848. Meanwhile, Batthyány travelled again to Vienna to seek a compromise with the new Emperor. His efforts remained unsuccessful, because Franz Joseph refused to accept the reform laws. This was an unconstitutional deed, because the laws were already signed by his uncle, and the monarch had no right to revoke laws which were already signed. So Batthyány and his government resigned, except for Kossuth, Szemere, and Mészáros. Later, on Palatine Stephen's request, Batthyány became Prime Minister again. On 13 September Batthyány announced a rebellion and requested that the Palatine lead them. However the Palatine, under the Emperor's orders, resigned and left Hungary. The Hungarian government was in serious military crisis due to the lack of soldiers, therefore they sent Kossuth (a brilliant orator) to recruit volunteers for the new Hungarian army. While Jelačić was marching on Pest, Kossuth went from town to town rousing the people to the defense of the country, and the popular force of the Honvéd was his creation. With the help of Kossuth's recruiting speeches, Batthyány quickly formed the Hungarian Revolutionary Army. The new Hungarian army defeated the Croatians on 29 September at the Battle of Pákozd. The battle became an icon for the Hungarian army for its effect on politics and morale. Kossuth's second letter for the Austrian people and this battle were the causes of the second revolution in Vienna on 6 October. Batthyány slowly realized that he could not reach his main goal, peaceful compromise with the Habsburg dynasty. On 2 October he resigned and simultaneously resigned his seat in parliament. The ministers of his cabinet also resigned on the same day. When Batthyány resigned he was appointed with Szemere to carry on the government provisionally, and at the end of September he was made President of the Committee of National Defense. Kossuth was elected by the parliament as the head of state of Hungary. With the exception of Kázmér Batthyány, all members of the new cabinet were formed from Kossuth's supporters. Head of state, Lajos Kossuth. During all the terrible winter which followed, his energy and spirit never failed him. It was he who overcame the reluctance of the army to march to the relief of Vienna; after the defeat at the Battle of Schwechat, at which he was present, he sent Józef Bem to carry on the war in Transylvania. At the end of the year, when the Austrians were approaching Pest, he asked for the mediation of Mr William Henry Stiles (1808–1865), the American envoy. Alfred I, Prince of Windisch-Grätz, however, refused all terms, and the Diet and government fled to Debrecen, Kossuth taking with him the Crown of St Stephen, the sacred emblem of the Hungarian nation. In November 1848, Emperor Ferdinand abdicated in favour of Franz Joseph. The new Emperor revoked all the concessions granted in March and outlawed Kossuth and the Hungarian government – set up lawfully on the basis of the April laws. In April 1849, when the Hungarians had won many successes, after sounding the army, Kossuth issued the celebrated Hungarian Declaration of Independence, in which he declared that "the house of Habsburg-Lorraine, perjured in the sight of God and man, had forfeited the Hungarian throne." It was a step characteristic of his love for extreme and dramatic action, but it added to the dissensions between him and those who wished only for autonomy under the old dynasty, and his enemies did not scruple to accuse him of aiming for Kingship. The dethronement also made any compromise with the Habsburgs practically impossible. In 1848 and 1849, the Hungarian people or Magyars, who wanted independence, formed a majority only in the central areas of the country. The Hungarians were surrounded by other nationalities. In 1848–49, the Austrian monarchy and those advising them manipulated the Croatians, Serbians and Romanians, making promises to the Magyars one day and making conflicting promises to the Serbs and other groups the next. Some of these groups were led to fight against the Hungarian Government by their leaders who were striving for their own independence; this triggered numerous brutal incidents between the Magyars and Romanians among others. In 1848 and 1849, however, the Hungarians were supported by most Slovaks, Germans, Rusyns and Hungarian Slovenes,    the Hungarian Jews, and many[ quantify ] Polish, Austrian and Italian volunteers. 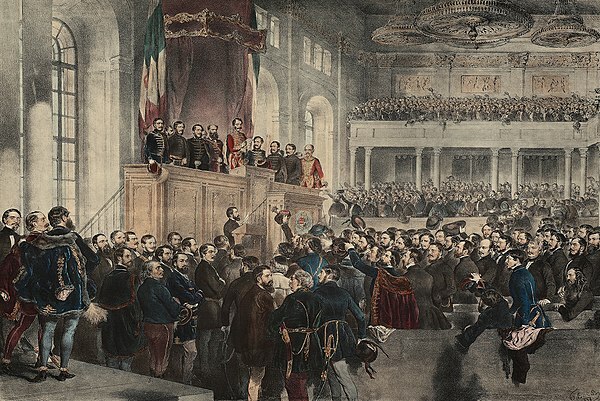 On 28 July 1849, the Hungarian Revolutionary Parliament proclaimed and enacted the first   laws on ethnic and minority rights in Europe, but these were overturned after the Russian and Austrian armies crushed the Hungarian Revolution. Occasionally, the Austrian throne would overplay their hand in their tactics of divide and conquer in Hungary – with some quite unintended results. This happened in the case of the Slovaks who had begun the war as at least indifferent if not positively anti-Magyar, but came to support the Hungarian Government against the Dynasty. But in another case, the Austrians' double-dealing brought some even more surprising new allies to the Hungarian cause during the war in 1849. Vojvodina became a Hungarian Crown Land after the defeat of the Ottoman Empire in the Great Turkish War. The Serbs of Vojvodina were expecting their requirement for Austrian military conscription to be the first measure to be relaxed. But the new Emperor Franz Joseph had other ideas and this promise was broken not more than two weeks after it had been made to the people of Vojvodina. This caused a split in the population of the Vojvodina and at least part of the Serbs in that province began to support the elected Hungarian Government against the Austrians.  . Some Serbs sought to ingratiate the Serb nation with the Austrian Empire to promote the independence of Vojvodina. With war on three fronts the Hungarian Government should have been squashed immediately[ according to whom? ] upon the start of hostilities. However, events early in the war worked in favor of the Government. The unity of the Serbs on the southern front was ruined by Austrian perfidy over the legal status of Vojvodina. Because of the success of revolutionary resistance, Franz Joseph had to ask for help from the " gendarme of Europe"  Tsar Nicholas I of Russia in March 1849. 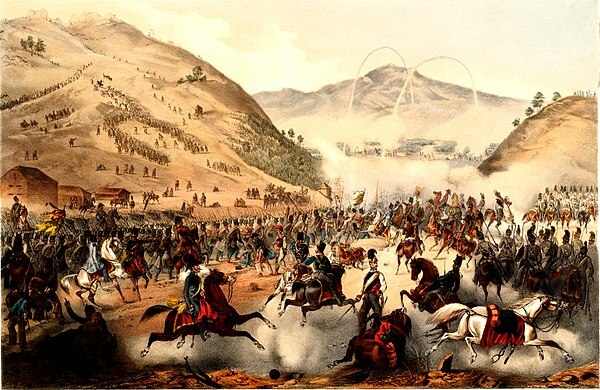 A Russian army, composed of about 8,000 soldiers, invaded Transylvania on 8 April 1849. But as they crossed the Southern Carpathian mountain passes (along the border of Transylvania and Wallachia), they were met by a large Hungarian revolutionary army led by Józef Bem, a Polish-born General. Laval Nugent von Westmeath was the Austrian Master of Ordnance, but was serving as the general in the field attempting to marshall all the Serbs still loyal to the Austrian throne, for another offensive against the Hungarian Government. Here, even on the southern front the Hungarian Armies were proving successful, initially. This combat led to the Vienna Uprising of October 1848, when insurgents attacked a garrison on its way to Hungary to support forces. However, the Austrian army was able to quell the rebellion. At the same time, at Schwechat, the Austrians defeated a Hungarian attempt to capture Vienna. After this victory, General Windischgrätz and 70,000 troops were sent to Hungary to crush the Hungarian revolution. the Austrians followed the Danube down from Vienna and crossed over into Hungary to envelope Komorn (now Komárom, Hungary and Komárno, Slovakia). They continued down the Danube to Pest, the capital of the Hungarian Kingdom. After some fierce fighting, the Austrians, led by Alfred I, Prince of Windisch-Grätz, captured Buda and Pest. (the town was known in German as Ofen and later Buda and Pest were united into Budapest). In April 1849, Ludwig Baron von Welden replaced Windischgrätz as the new supreme commander of Austrian forces in Hungary. Instead of pursuing the Austrian army, the Hungarians stopped to retake the Fort of Buda and prepared defenses. At the same time, however, victory in Italy had freed many Austrian troops which had hitherto been fighting on this front. In June 1849 Russian and Austrian troops entered Hungary heavily outnumbering the Hungarian army. After all appeals to other European states failed, Kossuth abdicated on August 11, 1849 in favour of Artúr Görgey, who he thought was the only general who was capable of saving the nation. However, in May 1849, Tsar Nicholas I pledged to redouble his efforts against the Hungarian Government. He and Emperor Franz Joseph started to regather and rearm an army to be commanded by Anton Vogl, the Austrian lieutenant-field-marshal who had actively participated in the suppression of the national liberation movement in Galicia in 1848. 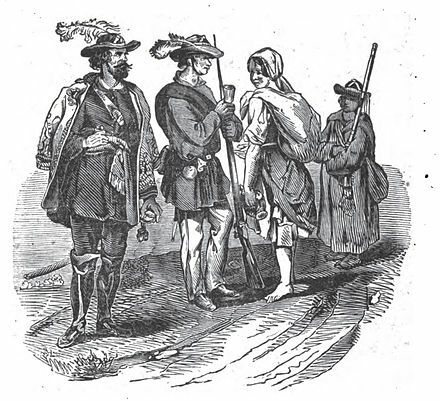 But even at this stage Vogl was occupied trying to stop another revolutionary uprising in Galicia. The Tsar was also preparing to send 30,000 Russian soldiers back over the Eastern Carpathian Mountains from Poland. 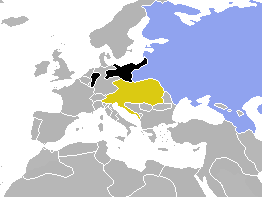 Austria held Galicia and moved into Hungary, independent of Vogl's forces. At the same time, the able Haynau led an army of 60,000 Austrians from the West and retook the ground lost throughout the spring. On July 18, he finally captured Buda and Pest. The Russians were also successful in the east and the situation of the Hungarians became increasingly desperate. 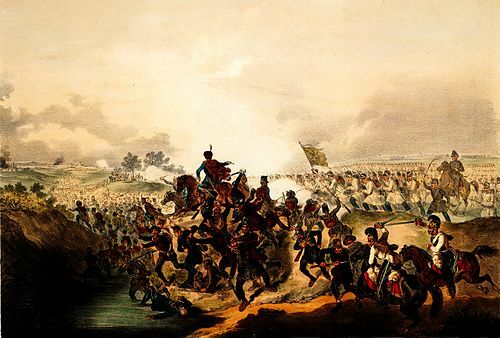 The Battle of Pákozd was a battle in the Hungarian Revolution of 1848, fought on the 29 September 1848 in the Pákozd – Sukoró – Pátka triangle. It was one of the most important battles of the revolution, in which the Hungarian revolutionary army led by Lieutenant-General János Móga defeated the troops of the Croatian Ban Josip Jelačić. A set of revolutions took place in the Austrian Empire from March 1848 to November 1849. Much of the revolutionary activity had a nationalist character: the Empire, ruled from Vienna, included ethnic Germans, Hungarians, Slovenes, Poles, Czechs, Slovaks, Ruthenians (Ukrainians), Romanians, Croats, Venetians (Italians) and Serbs; all of whom attempted in the course of the revolution to either achieve autonomy, independence, or even hegemony over other nationalities. The nationalist picture was further complicated by the simultaneous events in the German states, which moved toward greater German national unity. Lajos Kossuth de Udvard et Kossuthfalva 19 September 1802 – 20 March 1894) was a Hungarian nobleman, lawyer, journalist, politician, statesman and Governor-President of the Kingdom of Hungary during the revolution of 1848–49. Artúr Görgei de Görgő et Toporc was a Hungarian military leader renowned for being one of the greatest generals of the Hungarian Revolutionary Army. Count István Széchenyi de Sárvár-Felsővidék was a Hungarian politician, political theorist, and writer. Widely considered one of the greatest statesmen in his nation's history, within Hungary he is still known to many as "the Greatest Hungarian". Count Josip Jelačić von Bužim was the Ban of Croatia between 23 March 1848 and 19 May 1859. He was a member of the House of Jelačić and a noted army general, remembered for his military campaigns during the Revolutions of 1848 and for his abolition of serfdom in Croatia. Count Lajos Batthyány de Németújvár was the first Prime Minister of Hungary. He was born in Pozsony on 10 February 1807, and was executed by firing squad in Pest on 6 October 1849, the same day as the 13 Martyrs of Arad. The Kingdom of Hungary between 1526 and 1867, while outside the Holy Roman Empire, was part of the lands of the Habsburg Monarchy that became the Empire of Austria in 1804. After the Battle of Mohács of 1526, the country was ruled by two crowned kings. Initially the exact territory under Habsburg rule was disputed because both rulers claimed the whole kingdom. This unsettled period lasted until 1570 when John Sigismund Zápolya abdicated as King of Hungary in Emperor Maximilian II's favor. Josif Rajačić was a metropolitan of Sremski Karlovci, Serbian Patriarch, administrator of Serbian Vojvodina and baron. The Serbian Vojvodina was a short-lived self-proclaimed Serb autonomous province within the Austrian Empire during the Revolutions of 1848, which existed until 1849 when it was transformed into the new (official) Austrian province named Voivodeship of Serbia and Banat of Temeschwar. Andrei Șaguna was a Metropolitan bishop of the Romanian Orthodox Church in Transylvania, and one of the Romanian community political leaders in the Habsburg Monarchy, especially active during the 1848 Revolution. He was an honorary member of the Romanian Academy. Baron Ádám Récsey de Récse was a Hungarian general, joined the army of Habsburg Monarchy, and briefly a politician who was appointed illegally as the Prime Minister of Hungary by King Ferdinand V during the Revolution of 1848, serving in this capacity from 3 October to 7 October 1848. Récsey countersigned his own appointment, neglecting the Diet of Hungary. He resigned when an uprising broke out in Vienna in the effects of the Hungarian Revolution. He was the only Hungarian Prime Minister, who was born in the 18th century. Sir Mór Perczel de Bonyhád, was a Hungarian landholder, general, and one of the leaders of the Hungarian Revolution of 1848. The Battle of Schwechat was a battle in the Hungarian Revolution of 1848, fought on 30 October 1848 between the revolutionary Hungarian Army against the army of the Austrian Empire, in Schwechat, near Vienna. 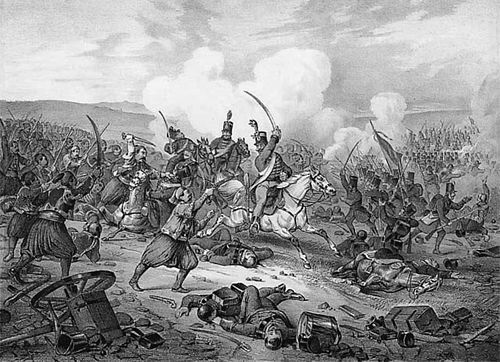 This was the last battle of 1848 in the Transdanubian campaign. The Hungarian Army was under the command of János Móga and the Austrian Army was under the command of Alfred I, Prince of Windisch-Grätz. The Slovak Uprising , Slovak Volunteer Campaigns or Slovak Revolt was an uprising of Slovaks against the Hungarian rule in Western parts of Upper Hungary, within the 1848–49 revolutions in the Habsburg Monarchy. It lasted from September 1848 to November 1849. László Csány was a Hungarian politician, who served as Minister of Public Works and Transport in 1849. He is a martyr of the Hungarian Revolution of 1848. The Hungarian State was a short-lived state that existed for 4 months in the last phase of the Hungarian Revolution of 1848–49. The Serb uprising of 1848–49, also known as the Serb revolution of 1848–49, took place in what is today Vojvodina, Serbia, and was part of the Revolutions of 1848 in the Austrian Empire. During the Hungarian Revolution, Hungarians achieved significant military successes, but were defeated after Russian intervention. Serbs led fierce battles against the Hungarians, with the help of volunteers from the Principality of Serbia. The outcome of the uprising was the establishment of Serbian Vojvodina, a special autonomous region under the Austrian crown. However, the Voivodeship failed certain expectations that Serbian patriots had expressed at the May Assembly (1848). Serbs did not constitute an absolute majority of the population, while the administration was largely in the hands of German officials and officers. The Voivodeship was abolished in 1860, however, some rights were kept by the Serb community. The Serbian Patriarchate was renewed, while the uprising had increased national awareness of the Serb people north of the Sava and Danube in the struggle for freedom. The Battle of Nagysalló, fought on 19 April 1849, was one of the battles between the Habsburg Empire and the Hungarian Revolutionary Army during the Spring Campaign in the Hungarian War of Independence from 1848–1849, fought between the Habsburg Empire and the Hungarian Revolutionary Army. Until 1918 Nagysalló was part of the Kingdom of Hungary; nowadays it is a village in Slovakia, its Slovakian name being Tekovské Lužany. This was the second battle in the second phase of the campaign, whose aim was to break the imperial siege of the fortress of Komárom and at the same time encircle the Habsburg imperial forces headquartered in the Hungarian capitals of Buda and Pest. The Hungarians routed the imperial corps led by Lieutenant General Ludwig von Wohlgemuth, which had come from the Habsburg Hereditary Lands, to help the imperial army sent to suppress the Hungarian Revolution of 1848 and independence. The Second Battle of Komárom, sometimes known as the Battle of Ács, took place at 2 July 1849, between the Hungarian army led by General Artúr Görgei and the imperial army of Austria led by Field Marshal Julius von Haynau, which had also an almost 12 000 strong Russian contingent led by Lieutenant General Fyodor Sergeyevich Panyutyin. The imperial army outnumbered the Hungarian troops by 2 to 1, was superior also regarding the multitude of infantry and light as well as heavy (cuirassiers) cavalry unit types, and the quality of the weapons. Except the problems of military kind, problems of other kind also influenced negatively the Hungarian army. Short before the battle, the conflict between the Hungarian commander, Görgei, and the political leadership of Hungary, Lajos Kossuth and the Szemere-Government, escalated abruptly. The government lead by Kossuth, decided to retreat the Hungarian troops from the perfectly defendable Komárom to Southern Hungary, leaving half of the country in the hands of the enemy, without consulting the war minister Görgei, who was the only person with the right to take a military decision. Görgei considered this illegal decision as very wrong, but he accepted to execute it, in order to avoid the confrontation with the political leadership in such a critical military situation, fixing the date of the depart towards southern Hungary to 3 July. 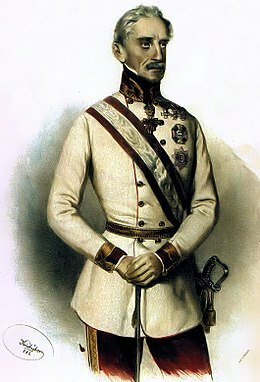 But despite of this, on 31 June Kossuth laid off Görgei from the high commandement of the Hungarian army, because he had read two of the latters letters in the wrong order. All these caused uncertainity and conflicts among the Hungarian officers and also soldiers before this very important enemy attack. 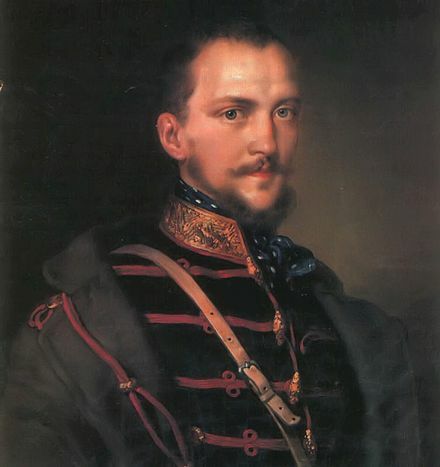 Kossuth even sent Lieutenant General Lázár Mészáros to Komárom, to take the leadership from Görgei, and send him to Pest. 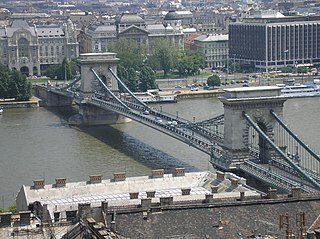 But when Mészáros approached on 2 July, on a steam boat, to Komárom, he heard the gunshots of the battle, and returned to Pest. The Austrian Supreme Commander Field Marshal Julius Jacob von Haynau's plan was to force the Hungarian troops to retreat in the fortress of Komárom, to lay, with a part of his army, a siege against it from the south, opening in this way the road towards Buda and Pest. After accomplishing this goal the bulk of Haynau's troops had to advance towards East, and occupy the Hungarian capitals, before his allies, the Russian main troops led by Ivan Paskevich, arrived there. The battle started on the early morning of 2 July with the attack of the I corps led by General Franz Schlik of the imperial troops from the direction of Ács, chasing quickly away the Hungarians from the Ács forrest, then pushing them into the fortifications lying South from Komárom, and even capturing the Monostor-trenches, thus entering in the fortifications, menacing to occupy the whole southern fortification and trench system of the fortress, putting in danger the Hungarian troops from there, to be completely encircled. 1 2 3 4 5 6 7 8 One or more of the preceding sentences incorporates text from a publication now in the public domain : Bain, Robert Nisbet; Phillips, Walter Alison (1911). "Hungary" . In Chisholm, Hugh. Encyclopædia Britannica . 13 (11th ed.). Cambridge University Press. pp. 915–918. ↑ "március15". marcius15.kormany.hu. Archived from the original on 2017-09-17. Retrieved 2018-03-16. ↑ "Az áprilisi törvények (English: "The April laws")" (in Hungarian). March 22, 1999. Archived from the original on 16 July 2011. Retrieved 28 June 2011. ↑ Gazi, Stephen (1973). A History of Croatia. New York: Barnes and Noble Books. p. 150. ↑ Schjerve, Rosita Rindler (2003). Diglossia and Power: Language Policies and Practice in the 19th Century Habsburg Empire. Language, Power, and Social Process. 9. Berlin: Walter de Gruyter. pp. 75–76. ISBN 9783110176544. ↑ Mahaffy, Robert Pentland (1908). Francis Joseph I.: His Life and Times. Covent Garden: Duckworth. p. 39. ↑ Walther Killy (2005). Dictionary of German biography. 9: Schmidt-Theyer. Walter de Gruyter. p. 237. ISBN 9783110966299. ↑ Július Bartl (2002). Slovak History: Chronology & Lexicon. Bolchazy-Carducci Publishers. p. 222. ISBN 9780865164444. ↑ Paul Bődy (1989). Hungarian statesmen of destiny, 1860-1960. Atlantic studies on society in change, 58; East European monographs, 262. Social Sciences Monograph. p. 23. ISBN 9780880331593. ↑ "Kik voltak a honvédek". www.vasidigitkonyvtar.hu (The Hungarian Peoples' Online Encyclopaedia) (in Hungarian). Archived from the original on 25 September 2008. Retrieved 2 July 2011. ↑ Jeszenszky, Géza (17 November 2000). "From "Eastern Switzerland" to Ethnic Cleansing, address at Duquesne History Forum" (PDF). Archived (PDF) from the original on 17 January 2013. ↑ Mikulas Teich; Roy Porter (1993). The National Question in Europe in Historical Context. Cambridge University Press. p. 256. ISBN 9780521367134. ↑ Ferenc Glatz (1990). Etudes historiques hongroises 1990: Ethnicity and society in Hungary, Volume 2. Institute of History of the Hungarian Academy of Sciences. p. 108. ISBN 9789638311689. 1 2 3 Marx & Engels, 8 April 1848. 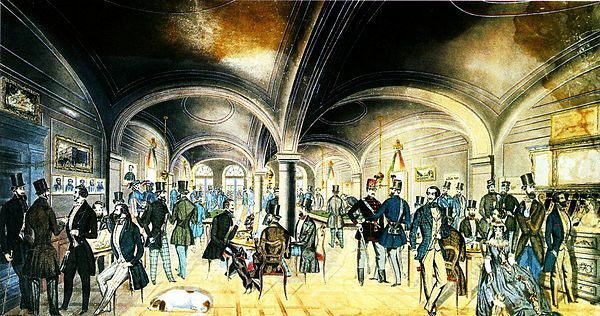 ↑ "Pákozd-Sukoró Battle 1848 Exhibition" (in Hungarian). Pákozd. September 29, 1998. Archived from the original on 28 July 2011. Retrieved 28 June 2011. ↑ "Isaszeg". 1hungary.com. Archived from the original on 7 July 2011. Retrieved 2 July 2011. ↑ Geert-Hinrich Ahrens (2007). Diplomacy on the Edge: Containment of Ethnic Conflict and the Minorities Working Group of the Conferences on Yugoslavia. Woodrow Wilson Center Press Series. Woodrow Wilson International Center for Scholars. p. 243. ISBN 9780801885570. ↑ Páva, István (1999-08-01). "Szlovákok a magyar szabadságharcban". magyarszemle.hu. Magyar szemle. ↑ Centrul de Studii Transilvane; Fundația Culturală Română (1998). Transylvanian Review. Romanian Cultural Foundation. ISSN 2067-1016. Archived from the original on 20 June 2015. Retrieved 20 June 2015. ↑ "Counter-revolution and Civil War". mek.oszk.hu. Archived from the original on 20 June 2015. Retrieved 20 June 2015. ↑ "The Gendarme of Europe". www.writewellgroup.com. 12 August 2010. Archived from the original on 26 March 2012. Retrieved 2 July 2011. 1 2 Szabó, János B. (5 September 2006). "Hungary's War of Independence". historynet.com. Archived from the original on 1 April 2008. Retrieved 2 July 2011. ↑ "Kormányzat". gepeskonyv.btk.elte.hu. Archived from the original on 8 May 2018. Retrieved 20 June 2015. ↑ "Mátyás Rákosi". September 12, 2001. Archived from the original on 15 June 2011. Retrieved 28 June 2011. 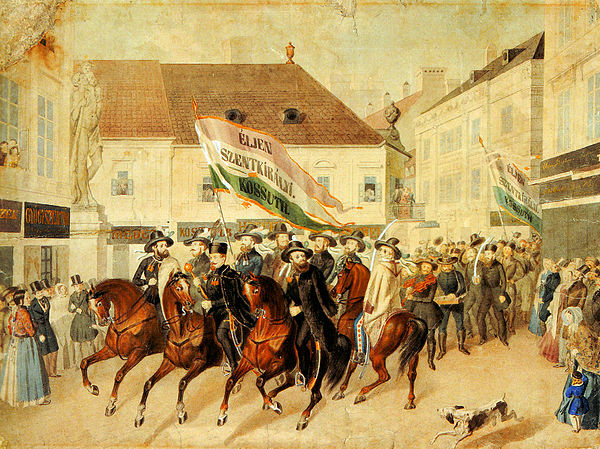 Wikimedia Commons has media related to Hungarian Revolution of 1848 .